Power Box Advanced (PB10-CD) job site player and power center is available with 4-way GFCI power outlet, integrated battery charger, and 12-volt outlet for charging cell phones. Ergonomically designed remote control enables one-handed or gloved use. Features include AM/FM digital radio, CD player, auxiliary jack for MP3 players, and 180Â° flexible rubber antenna. Product offers audio features such as bass and treble controls, volume controls, and anti-skip technology. Mt. Prospect, Ill. December 12, 2005 - The Bosch Power Box changed the face of job site entertainment forever. Now, Bosch Power Tools and Accessories announces the Power Box Advanced (PB10-CD), with a new multi-function keychain remote control, enhanced sound, improved reception and all the innovative features that made it the world's number one job site radio/CD player and power center. New features like a multi-function keychain remote control, enhanced sound, improved reception and more make the Power Box Advanced another great leap in the evolution of jobsite entertainment and utility. Professionals and serious do-it-yourselfers will continue to appreciate the Power Box's 4-way GFCI power outlet, integrated Bosch battery charger, 12-volt outlet perfect for charging cell phones and two-way radios, AM/FM digital radio, CD player and auxiliary jack for MP3 players or the new dock for iPod® . The new multi-function remote control fits perfectly into either side of the sturdy and centrally located Power Box handle. Controls include, volume, radio channel, CD player, mute function and on/off power. The ergonomic design enables simple one-handed or gloved use. And the keychain attachment adds convenience while preventing loss. Advances in reception and sound continue to make the Power Box the best jobsite option. For those working in poor reception environments, a new 180-degree flexible rubber antenna offers better reception, while tuner improvements further enhance the experience. Enhanced sound features such as a more powerful amplifier, premium speakers, individual bass and treble controls, expanded volume controls from 0 to 20, and improved anti-skip technology bring every musical note across crisp and clear. Users still don't need to worry about wasting precious power resources with the Power Box's built-in 4-way GFCI outlet and battery charging chamber, which handles any Bosch 12, 14.4, 18 and 24-volt battery, including the new BLUECORE line. Furthermore, the Power Box's renowned durability also continues with an aluminum roll cage. Sealed buttons, speakers, battery chamber and CD player also ensure protection from the elements. 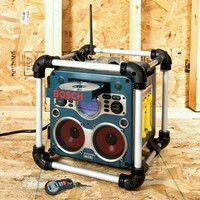 Find the Power Box Advanced wherever Bosch Power Tools and Accessories are sold. MSRP for the new PB10-CD remains at $179.99. Bosch Power Tools and Accessories is one of the divisions within the $1 billion, 4,000 employee strong Robert Bosch Tool Corporation, which is the North American branch of the largest power tool and accessory manufacturer in the world, Robert Bosch GmbH. Bosch provides a complete line of corded and cordless power tools and accessories engineered to survive any jobsite and allow professionals to take control of their work. For more information, call toll free 877-BOSCH-99 (877-267-2499) or visit www.boschtools.com. In North America, the Bosch Group manufactures and markets power tools and accessories, automotive original equipment and aftermarket products, industrial automation and mobile products, security technology, thermo-technology, packaging equipment and household appliances. Bosch employs nearly 23,000 associates in more than 80 primary and 20 associated facilities throughout the region with reported sales of $7.8 billion in 2004. For more information, visit www.bosch.us. Portable 2-Way Radios come in 4- or 16-channel models. Outdoor Radio Unit supports microwave trunking applications.